This month has been filled with so many non meteorite activities that it has been really hard to find time to write an article. 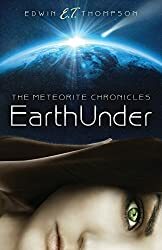 But, on the meteorite list there was an email about metallic spheroids from Barringer Meteorite Crater (Meteor Crater). This gave me an idea for a short article about collecting them. 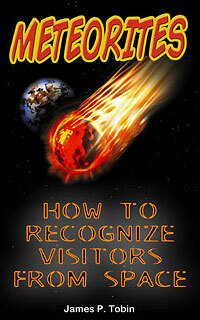 The mass of the impactor at Meteor Crater has been debated for a century and changes regularly still. But, it seems to fall in the 100-200 thousand ton range currently. There is no doubt about there being a lot of buried fragments deep under the floor of the crater interior. Many of the small churn drill holes were abandoned after hitting meteorite fragments. Too often were they hit to be mere coincidence. But, even thousands of fragments does not raise the mass of surviving nickel iron to near that of the original impactor. 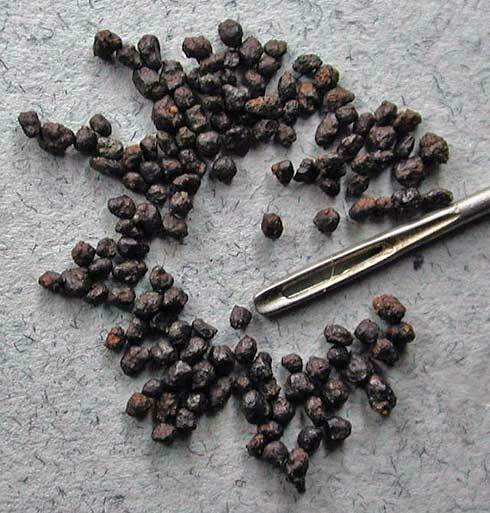 The major surviving material is still the tiny metal drops that are found in the soil for miles around the crater. They range in size from a tiny fraction of a millimeter to a couple millimeters. They condensed out of the vapor cloud soon after the crater forming explosion and fell as a portion of the fallout. They are called spheroids but that can be a little deceiving often they are not very spherical. Many are elongated. Standard screens for geology and other applications come in many mesh sizes. For example, a No. 100 sieve will have a 150 micrometer opening, or a No. 60 sieve a 250 micrometer opening. The sieves are always marked in inches also. So that the examples of the last sentence would be .0059 and .0097 inches. A full set of fine sieves consists of 18 sieves from #5 to #325. Number 5 will hold anything larger than .157 inches and # 325 will pass anything finer than .0017 inches. In addition there is a set of five coarse sieves that initially grade material between one inch and .25 inch. 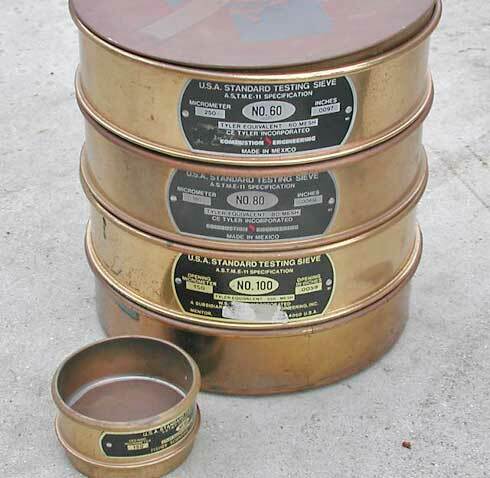 Brass sieves come in both a 3 inch diameter and a 8 inch diameter. There is a plastic sieve set that is 6 ¾ inches in diameter. I have never used plastic sieves. They are all made to stack with a pan placed at the bottom of the stack to catch the finest of material. There is a lid on the top of the stack to prevent losing any of the measured or weighed sample during shaking. Normally each of the fractions of the original sample will be weighed and the information recorded on a chart. Then the fractions collected from each sieve will be bagged and tagged and stored with the remainder of unprocessed material from the particular location. Any large stones or pebbles would have been removed by coarse screening previously. These large objects banging around in the sieves would damage the delicate wires of the screens. In practical use you would probably not need all sixteen fractions. Instead you would probably use eight sieves skipping every other mesh size. Or if you knew what you wanted to find was always very small you could used a couple coarser size meshes to catch the large material and then use many fine screens for the very small material containing what you were looking for. That would grade by size the small material your wanted without increasing quite so much the number of fractions to work with. Normally I carry a three inch medium mesh screen with me when doing marine-sand fossil collecting. It is really helpful in catching all the fossils and saves me bring home a lot of well sorted sand. But, in the desert or around Meteor Crater the soils are not so nearly well sorted. And separation can not be done easily at the sampling site. So the bulk sample is collected and the location marked. In the lab the separation work will be done. Sample bags and tags are available from geological supply houses for this purpose. The tags are often paper today but used to be aluminum and you could “write on them” with a scribe so that the tag was permanent. So after all of that discussion a sample of dirt from Meteor Crater is put in the top of a sieve stack and shaken. Each fraction is collected from each sieve and the spheroids if any are extracted. At Meteor Crater as Nininger found there are a lot of different things that are attracted to a magnet in the soil. So magnetic separation of spheroids is challenging. I have found that by keeping the sieved sample small the number of particles to examine under a microscope is small. The individual spheroids can be extracted with a slightly magnetized needle. And removed from the needle to a collection bottle with a more powerful magnet. Its pretty delicate work and getting to be beyond me as I get older, but it is still always fun to find spheroids that are 49,000 years old and represent the remains of an asteroid. Spheroids give me a wonderful opportunity to play with another hobby, scales. The question on the news group was how large is a size #24 interesting enough, but how much does a spheroid weight? That is what interests me. And it proved to be a real challenge to get even a rough weight. I took a sample of spheroids that were all small. But they were not precisely graded. I visually graded one hundred of these. I have to admit that even my finest scale will not weigh a single spheroid accurately enough. So to average the error I used the hundred. This figure is basically meaningless without a micrograph showing a grid for the size of the spheroids, but that will have to be a project for another day. The calculated weight of one of these small spheroids was .00012375 grams. I should add that I got a very accurate weight on the one hundred and the main variable would be the differences in size in my visual separation. This could be removed by using the sieves described above. But, I hate to risk losing any spheroids in handling and resist running them through a sieve should they spill. There were a whole spectrum of sizes even smaller then the size I selected so billions must be in the soil around Meteor Crater. And these are the ones with nickel and cobalt enough to survive since the impact. Many times as much Nininger believed had been lost to time and weather.